Reading more poetry with my students has been a goal of mine these past few years, and it’s been a goal I feel has been readily achieved with ideas like creating Heart Books or reading novels in verse. But writing poetry–well, that’s a different story. Students who aren’t accustomed to writing poetry need a scaffold before they can leap into free verse composition without a topic, genre, or form prompt. For this scaffold, I use imitation. Objectives — Using the language of the Depth of Knowledge Levels: Identify patterns of language, structure, and punctuation in a given poem; Modify the style of the given poem to suit your purpose; Create a poem in the style of a given poem. 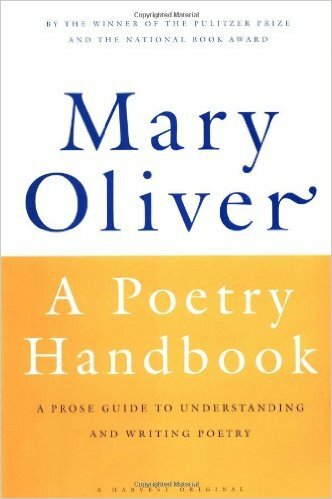 Lesson — Before the mini-lesson, I will have already booktalked two of Mary Oliver’s books–A Poetry Handbook and Dog Songs, which is always a favorite with my students. As the mini-lesson begins, I’ll read to them from Oliver’s chapter on imitation. “I’m going to write with you, and I’m going to choose ‘A Display of Mackerel,'” I say. “It seems long, but look how short the lines and stanzas are.” I put my chosen poem under the document camera. “Now, this poem is about a display of fish, and I want to imitate it and write about a display of something. There’s a pretty big display of colorful objects in my room…” I trail off. “Your library!” Nathan helpfully supplies. We set about writing together. After 10-15 minutes, we each have a full imitation poem. We break into small groups, working with others who imitated our same poem. We read our poems aloud. Feedback is given on what we notice–similarities to and diversions from the original, and the effects of both. Follow-Up — We’ll practice imitation a few more times before we leap into writing poetry independently. When we do, I’ll ask, as always, that my students create a small anthology of their work on that genre–some samples of their early forays into poetry through imitation, as well as a few examples of their own independent attempts. I’ll definitely include my “A Display of Books” in my own anthology, as I find it a lovely description of my library that I’d like to preserve. think sun spearing through clouds. forward, heedless of their lifelessness. which is the price of publication.